Lead guitarist Paul Jackson, Jr., known for playing on stage with such icons as Michael Jackson, Dru Hill, Whitney Houston and Patti LaBelle, joins the trio Jazz Funk Soul on their January 25, 2019 album release "Life and Times" (Shanachie Entertainment). The group consists of Grammy Award nominated Everette Harp on saxophone and Grammy winning Jeff Lorber on keyboard. 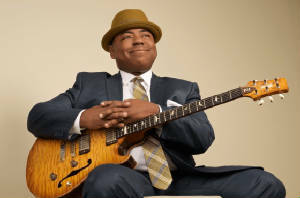 Grammy nominated Paul Jackson, Jr. fills in for the group's late founder Grammy nominated guitarist Chuck Loeb. "Technically yes, this is the first time I've been in a group," Jackson, Jr. said. "But I have worked with Everette with George Duke on the road and Jeff Lorber I've worked for 30 years on his projects." Paul, who also plays on stage as part of the "Tonight Show with Jay Leno" and "American Idol" orchestras, recording credits include Michael Jackson's "Thriller", "Bad," and "Dangerous," The Jackson's "Destiny" and "Triumph" and Whitney Houston's "Greatest Love of All." He has released eight solo albums and received his Grammy Award nomination for his debut album "I Came to Play." "The guys decided to continue the group and I was pleased," Paul said earnestly. During the recording of "Life and Times," with Harp and Lorber, Jackson, Jr. said abut the experience, "I (normally) do one guitar part...Everette likes to do three parts and choose from them. That was different for me. Before, we'd write songs and bring them to the table, this time we did a lot of co-writing." Paul said there was one song he had brought to the table, which they used but it was changed during the process. Jazz Funk Soul formed in 2014 and released a self-titled album that year. That project was followed by "More Serious Business" in 2016. Chuck passed away in 2017 and on January 25th Jackson, Jr., Harp and Lorber continues the Jazz Funk Soul trio with the release of "Life and Times." Jackson, Jr. teaches at his Alma Mata, the University of Southern California, where Grammy Award nominated Patrice Rushen ("Forget Me Nots") designed the program. When he was a young musician a mentor told him he needed to start playing guitar like Paul Jackson, Jr.
"So I'd write songs and play songs...as God directed and as you play and soul-seek you end up a conglomeration of what you heard. It all comes together over the years and you will start to come out." That is certainly what Paul did, come out, because his guitar playing has a signature sound that I can identify no matter what project he is on.